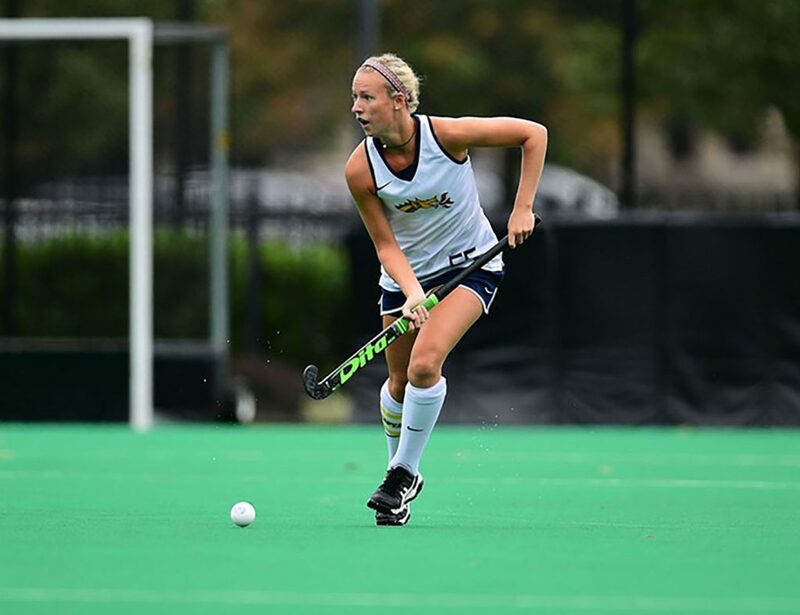 A hot summer afternoon did not stop the Drexel University women’s field hockey team from claiming a shootout win over Bucknell University after double overtime. The final score was 3-2 as Drexel improved to 4-6 and Bucknell fell to 3-7 in season play. In the first nine minutes of play, Bucknell came out strong taking two shots on goal within the first two minutes. Both shots were saved by junior goalkeeper Erin Gilchrist. It wasn’t until 12:08 into play that sophomore Tess Bernheimer would claim the first goal of the game, her third of the season, as she found the net when the goalie was pulled out of position. A little over three minutes later, Bucknell tied the game as Sarah Dimock scored off a deflection. Through the rest of the first half, the Dragons were on defense. Bucknell outshot the Dragons 14-2 and Gilchrist made four saves in the first half alone. The second half began with tough offenses and defenses for both teams as the players tried to find a rhythm. In the 56th minute, the Dragons changed the pace of the game in their favor. Megan Wiest scored her third goal of the season with an assist from Isis Cornelissen and junior Kate Bagdon to put the Dragons up 2-1. With less than seven minutes left in the second half, Bucknell tied the score again as Brittany Willwerth found the back of the cage unassisted. The half concluded and the players proceeded to the first overtime. Lexi Quick of Bucknell took the first shot just 46 seconds into overtime play, but it went wide outside the cage. Bucknell goalkeeper Emily Finn saved all three of the Dragons’ shots on goal while Gilchrist saved Bucknell’s two shots to keep the game even. After the first 15-minute overtime, the teams forced a second overtime period. The goalkeepers each recorded two more saves to hold the score still tied until the end of the 100th minute. A shootout would decide the winners of the game. The shootout representatives were chosen by each team and sent onto the open field. After winning the toss, the Bucknell Bison sent Chloe Poltonavage up to shoot first, and she made her shot. The Dragons sent Cornelissen up, but she missed on their first attempt. They were now down 1-0. The Bison’s second attempt was made by Allie Christopher. The next three Drexel attempts would all be made to claim the victory over the Bison. Junior Rebecca Weinstock and Tess Bernheimer would tie the shootout 2-2 as the Bison missed one. Another miss for the Bison from Leah Fogelsanger put Bucknell in trouble. Freshman Chandler McFeeley was Drexel’s last representative, and she made the stroke-off goal to put the Dragons up 3-2 in the shootout. A final attempt from Bucknell was missed by Kaelyn Long, and the Dragons were awarded the 3-2 victory. A total of 10 saves for Erin Gilchrist puts her total for the season at 68 through 10 games. The Dragons will host the reigning national champions from the University of Delaware Friday, Sept. 29, 7 p.m. at Buckley Field for their first game in Colonial Athletic Association play. They will then move on to host the Bryant University Bulldogs Sunday, Oct. 1 at noon. Come out to support the Drexel women’s field hockey team as they look ahead to the second half of their season with a busy October schedule before the CAA tournament begins in November.